Whether you operate regionally, nationally or globally, Planet has you covered. Planet provides cost-effective and information-rich agricultural data, so you can make better, more informed decisions at any scale - whether you are monitoring crops, tracking farm operations and activities, scouting crops or performing predictive analysis. 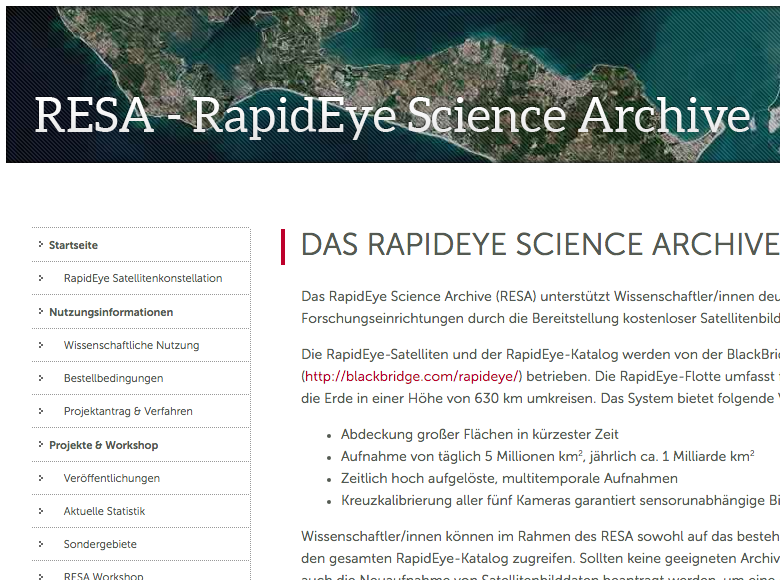 The RapidEye Science Archive (RESA) is a joint initiative of Planet Germany and the German Space Agency (DLR). RESA’s purpose is to stimulate scientific and industrial application development of RapidEye data for a wide range of application fields. The partners provide a pool of RapidEye satellite data for scientific projects conducted by German-based researchers. Scientists who wish to include RapidEye satellite data in their research projects, are invited to apply for free access to data. Registered users can utilize 20 million square kilometers of archived imagery. There is a limited access to new data acquisitions, while data contained in RESA can be freely ordered. Detailed information can be found at the RESA web portal (in German).